In the morning transfer to Perge ( 1h30 hrs) is like a port because it was possible to navigate.An important trade route starting from Side run through Perge. It is also famous by the fact that when St. Paul started his journeys, he visited Perge in 46 A.D. and preached his first sermon here. After visiting Perge we go on the transfer to the lunch stop with the scenery of Aksu river. After lunch we start our first walk to Akcapinar village where we will stay in a village house . 3 hrs walk . Dinner and overnight in village house. BLD. In the morning we walk up the Pinargozu river through woodland to the first of two spectacular waterfalls. Walk on to second waterfall, swim in woodland pool and we have our picnic here. Then on forest tracks and old Roman road to the Pisidian/ Roman site of Pednelissos, perched on the slopes of a huge rocky outcrop. Visiting the extensive, unexcavated site, which has superb views and original fortifications. Descend to road and village; camp behind the old village school. (6-7 hrs ) Diner and overnight at camp. In the morning we walk on forest tracks through the tiny villages of Belen and Bozdogan. Meet vehicle for short transfer and continue across a range of hills with spectacular views of Bozburun mountain. Meet vehicle again for lunch at village of Karatas; continue on forest paths to Oren village, then a stiff climb up to the summer pastures with nomad tents; walk on a forest road to our 'wild' campsite on a bluff overlooking the lake of Karacaoren. (7-8 hrs walking). Diner and overnight ib camp. The Roman road through the canyon has been eroded away, so we take a modern footpath (the 'Okuz Yolu' or Cattle track) from near the fish farm on a stiff climb over a ridge (some minor scrambling) with views over the canyon, to the village of Curuk. Picnic at village spring, and walk along forest road to meet the minibus. Short transfer to the river valley (.3 hr). Cross the dam over the river and walk up hill through pines to the ruins at Taskapi (Stone gate), on the Roman road, and on to our pension at Sutculer, the only larg(ish) market town in the area. Explore town, dinner and night in small pension at edge of town. 6 hrs walking. 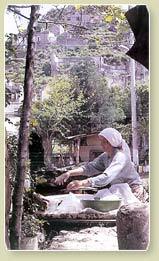 In the morning we take an old road to village of Muezzinler, a pretty village in woodland perched on the canyon edge. Walk on forest road down into the Yazili canyon. Picnic by the river near remains of Selcuk bridge over the river; opportunity to swim or paddle in the pools. Climb up the old cobbled mule trail through forest with canyon views on a steep climb back to Muezzinler. Meet our minibus and a short transfer back to pension (15 mins). Dinner and overnight in pension. (6 hrs walking). In the morning we have an easy walking over Roman roads and tracks to the start of the spectacular stone causeway leading up the hill to the site of Adada. This 1.5km stretch of huge slabs is the original road that St Paul walked and leads to a little-known site tucked on a tiny plain beneath an acropolis hill. Meet vehicle, explore the fascinating site, which has three temples and is know for its butterflies and birds, and camp near the ruins. In the morning transfer to Egridir lake, is set in idyllic natural surroundings. Visiting Egidir lake. Continue the driving to Antalya, principal holiday resort of Turkey at the Mediterranean sea , is an attractive city with shady palm-lined boulevards. Kaleici where we will stay is narrow, winding streets and old wooded houses abut the ancient city walls. Dinner and Overnight in hotel. In the morning, transfer to Ulupinar village. We ascend till the ridges of Mt. Olympos by passing through the river. 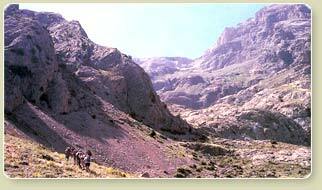 Here we will admire the scenic of Cirali and descending to the flames (Chimaera). it is a result of escaping natural gas, whose flames have been shooting heavenwards for centuries. We go down to Olympos , which was a port city established in the 2nd century and which continued to flourish until the 15th century A.D. The antique city is on two sides of a beautiful valley. A sandy beach is found where the town and the valley meet the sea, into which a mountain stream flows. Overnight Pension. BLD 4-5h walking . In the morning after breakfast transfer (2h) to Kapakli the villagers preserve their costume for years. We will take the way till Ucagiz (means the three mouths or the three harbours). This place is declared forbidden protected zone to the construction and remain a town fishers and agricultural by the sea. Here taking a small boat, we have opportunity to discover the region of Kekova through crystalline waters a swallowed up city, and then visit citadel of Simena, been founded to the IV th. century ,with a superb view on the islands and to bathe in waters . Overnight pension. In the morning, we drive to Phaselis, was founded in the seventh century by colonists from Rhodes. It was a Lycian city and had three important ports which were m constant use, two of which were connected by a road lined with statues (some inscriptions can still be seen) and porticoes where artisans worked and traded. After visiting driving to Antalya principal holiday resort of Turkey at the Mediterranean sea , is an attractive city with shady palm-lined boulevards. Kaleici where we will stay is narrow, winding streets and old wooded houses abut the ancient city walls. Overnight hotel.